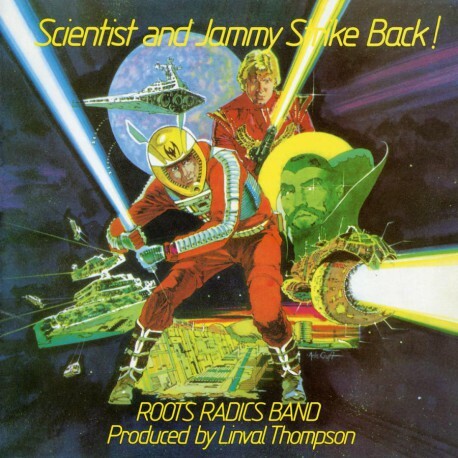 > Música>Reggae Roots, Dub, Ragga, Rockers>LP>Scientist And Jammy Strike Back! Hopeton Overton Brown, better known as Scientist, rose to fame during the 1980s as dub music mixer. He collaborated with the Jamaican mixer and producer Prince Jammy a couple of times, most prominent on their album Scientist & Prince Jammy Strike back! Scientist was inspired by the science fiction movies and a part of the album breathes the atmosphere of the unknown. But mostly it's the Roots Radics, providing the rhythms, which creating the whole feeling of this Jamaican piece. Sweeping and swooshing with echo's and dubs it's artefact for the style of late '70s early '80s reggae.